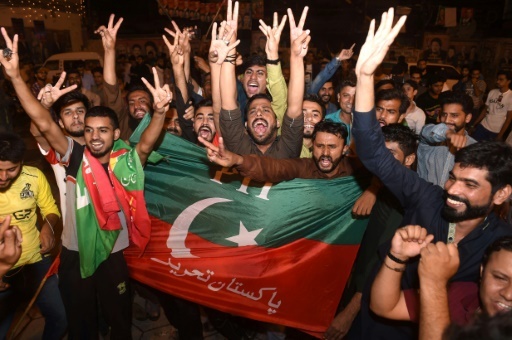 Islamabad (AFP) – Pakistan cricket hero turned politician Imran Khan claimed victory Thursday in the country’s tense general election marred by allegations of “blatant” rigging by rival parties. A visibly tired Khan cut a conciliatory tone in a wide-ranging address to the nation following a controversial contest hit with by accusations from major political parties of poll “rigging” and long delays in still unreleased official results. Unofficial projections by various local media outlets showed Khan’s Pakistan Tehreek-e-Insaf (PTI) party enjoying a clear lead. 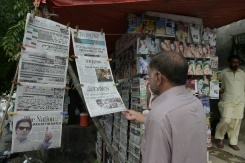 “We were successful and we were given a mandate,” Khan, 65, said during a live broadcast from his home in the capital Islamabad, adding that there was “no politician victimisation” of his opponents in the acrimonious contest. He went on to call the elections the “most transparent” in the country’s history. During the broadcast, Khan vowed to tackle corruption that was “eating our country like a cancer” and touched on promises to balance relations with the US that would be “beneficial” for both countries. Late Wednesday, the once-mighty Pakistan Muslim League-Nawaz (PML-N), which had been in power since 2013, rejected the results because of “outright rigging”, and vowed it would use “all political and legal options for redressal of these glaring excesses”. “What they have done has pushed Pakistan back 30 years… People will not bear it,” the party’s leader Shahbaz Sharif, brother of jailed former premier Nawaz Sharif, said. Other major parties also alleged fraud, including the Pakistan Peoples Party (PPP), whose chairman Bilawal Bhutto Zardari echoed the PML-N’s claim that party representatives were barred from monitoring the count. “The surprisingly high seat total for PTI, even as the votes continue to be counted, will be enough to trigger the suspicions of the PPP and PML-N,” said Michael Kugelman, an analyst at the Wilson Center in Washington. At least one party — Tehreek-e-Labaik Pakistan (TLP), which blockaded the capital Islamabad for weeks last year over blasphemy — has already announced it is planning protests. “This is complete chaos,” said political analyst Azeema Cheema, saying she was “very concerned” about what comes next. First-time voter Fahad Hussain, 21, said the party had “motivated the youth” as he hit the streets in Islamabad to celebrate with friends. Khan, who captained Pakistan to their World Cup cricket victory in 1992, campaigned on promises to end widespread graft while building an “Islamic welfare state”. But he was dogged by the accusations he was benefiting from a “silent coup” by the generals which targeted the PML-N. Nawaz Sharif was ousted from power last year and jailed over a corruption conviction days before the vote, removing Khan’s most dangerous rival. Featured Photo: AFP / ARIF ALI. Imran Khan’s supporters have been celebrating as partial results suggest victory for the former cricket star. David Stout is an AFP correspondent in Pakistan. His reporting has also appeared in The New York Times, The Washington Post, Time Magazine, Business Insider, The Globe and Mail, Yahoo, The Boston Globe, Seattle Times, France 24, and The Columbus Dispatch. He previously reported from Hong Kong, Thailand and Vietnam.